Ready to run in 2019! Iqraa’s 2018 running campaign had 16 runners completing races such as the Prince William Half-marathon, the Marine Corps, Richmond, and New York City Marathons, and a local 10K. We raised over $22,000 for education programs in Palestine. Our aim for 2019 is to recruit 20 Iqraa runners to wear our red and white jersey and to raise $30,000 for education in Palestine. Iqraa’s characteristics are our focus on positive, constructive contributions to the development of Palestinian intellectual capital, our secular and non-political approach to awareness-raising, the diverse background of our runners, including men and women from multiple ethnic and faith traditions, and the camaraderie we build while Running for a Brighter Palestine. 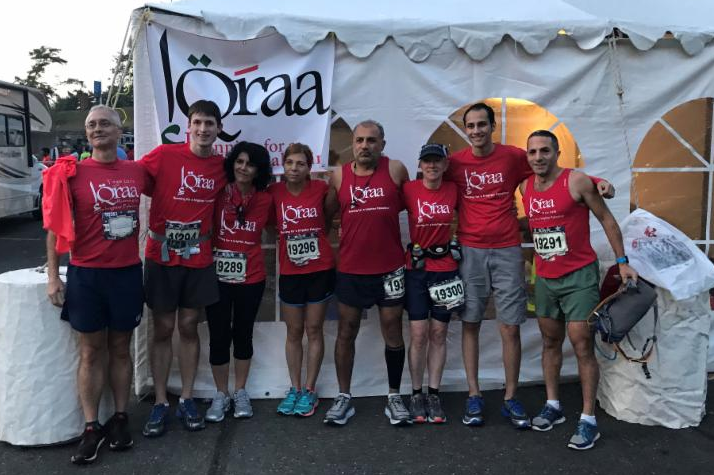 Iqraa has been active in running in the DC metro area since 2008, partnering each year with United Palestinian Appeal (UPA), which implements the education programs we fund, and with Marathon Charity Cooperation, which oversees the training program for our runners. Iqraa runners and volunteers participate in both partnerships through our running and fundraising, by hosting and coaching many of the training runs, as well as by staffing the aid stations at a number of local running races during the year. As a result, joining Iqraa is a great opportunity to grow stronger in a variety of ways, including your physical fitness, your ties and contributions to society, and your friendships. We’re planning information sessions in late April at UPA’s office near Dupont Circle, and a potluck at an Iqraa member’s home in early May, so you can learn about our program and register if you’re interested. The UPA address is 1330 New Hampshire Ave, NW, Washington DC 20036. Join us to reach your goals and ours: fitness through running and contributing to a great cause! We’ve trained over 160 Iqraa runners to complete their races and raised over $250,000 since 2008. Become one of our 2019 runners by signing up at one of the information sessions in April, or at our potluck. Please RSVP by emailing: kirkcruachan@yahoo.com. To contribute to our effort, click on this link at the UPA website, select Sponsor a Runner, and select a runner or the general fund: http://upaconnect.org/get-involved/iqraa/.